Tom Holt is a funny guy. Orbit UK has been publishing him for a long time and I was thrilled to get to redesign his look with his US launch of Blonde Bombshell in June. I can’t wait to start applying the new look to the backlist titles waiting to roll out. 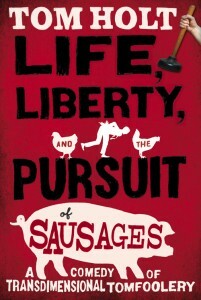 But first we have another new book, one which wins for my favorite title of all time* Life, Liberty, and the Pursuit of Sausages. 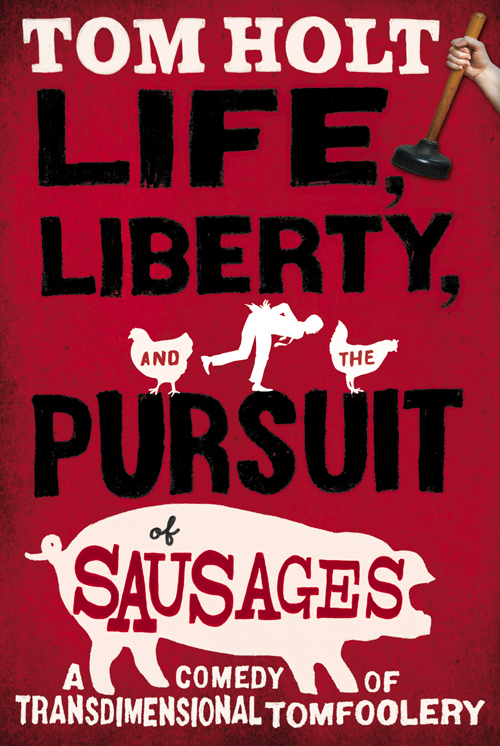 Tom Holt is all about funny, absurdist scifi/fantasy, and when I read my first Tom Holt book I was pleasantly surprised how like Douglas Adams and Terry Pratchett it felt. and that’s high praise from me. I really like the humorous scifi/fantasy subgenre, and I think we’ve been packaging it well here at Orbit with the A. Lee Martinez books especially, and I’m really happy to add these books to the list.